Last week, United Nations gathered in New York, USA, to talk about prevention and control of non-communicable diseases (NCDs). Non-communicable diseases are non-infectious, of long duration and generally progressing slowly. Due to the fact they are not infectious, there is no pathogen to target and there is no transmission medium to fight. Due to their long duration and slow progression, one usually notices NCDs when it’s too late and eradicating NCDs is less spectacular than other (not less important) infectious diseases. However WHO measured that NCDs represents more than 60% of all deaths in the world. For the occasion, WHO released an introductory video that summarize the issue. NCDs are not directly in the UN Millenium Development Goals but I already mentioned they represent 4 of the top 5 killers in the USA. Two of them are also in the top 5 killers worldwide. If the Millenium Goals succeed, non-communicable diseases will be the next big issue in health. 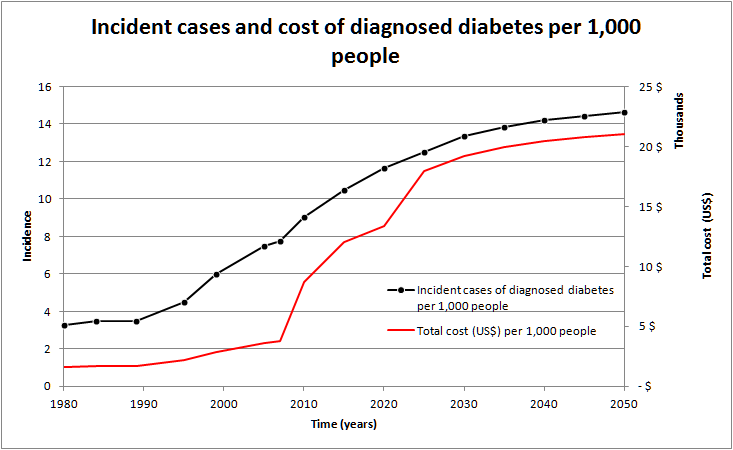 Although NCDs were considered as a disease limited to high income countries (with infectious diseases affecting low income countries), this is not really the case anymore. 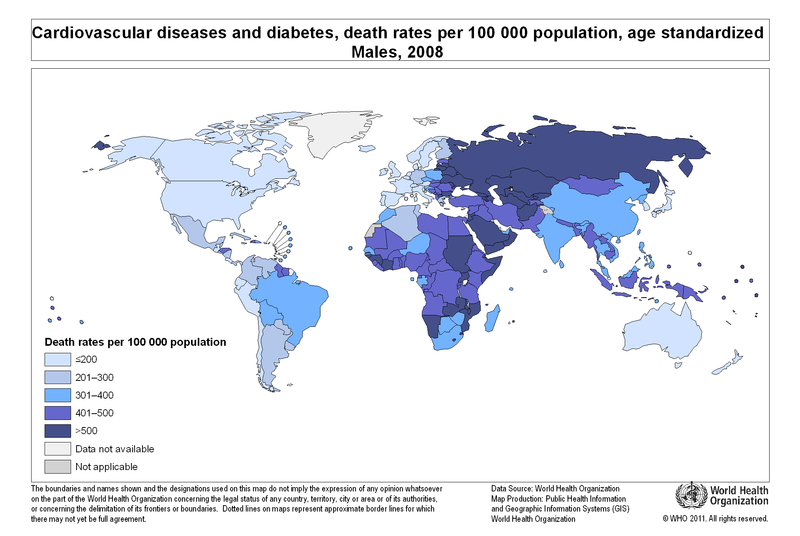 For instance, the map of male deaths due to cardiovascular diseases and diabetes in 2008 shows an approximately uniform rate in high income countries with some higher rates in low income countries (especially on the African continent). If you are looking for more numbers, visit the WHO Global Health Observatory on Noncommunicable diseases. If nothing is done, the incidence of NCDs will increase. On top of being a health issue, a matter of life and death, it will also become an economical problem as the costs of treatment as well as the indirect costs will also dramatically increase (increase per case treated and increase due to the number of cases treated). WHO: Scaling up action against noncommunicable diseases: How much will it cost? To end on a positive note, all these risk factors can be easily controlled and for a limited additional cost. For instance, governments can protect people from tobacco (taxes as well as bans on tobacco advertising, promotion and sponsorship, …) and alcohol (access restriction, bans on advertising, …) as well as promote public awareness about diet and physical activity. Companies can also promote healthy diet and physical activities to their employees. On top of that, the food industry can also include relevant actions in their corporate social responsibility policies. Finally on a personal level, we can increase our physical activity, increase fruit and vegetable intake, reduce our use of tobacco and alcohol, etc. Simple, cheap actions ; huge interesting consequences. I became recently interested in wearable electronics and wearable communication. I think we usually don’t need a computer at home. But I also think that electronics, sensory / storage / communication / helper devices will invade our world (privacy) at one point. A few months ago, I liked Phillip Torrone’s retrospective collection of wearable electronic devices (for Make:). It will be quite fun to wear some of the stuff he showed. However most of the current applications shown are mostly designed to collect information from the body they are attached to or to communicate with this body. This is very much self-centered. Recently (tonight), I watched Kate Hartman’s TED talk: The art of wearable communication. 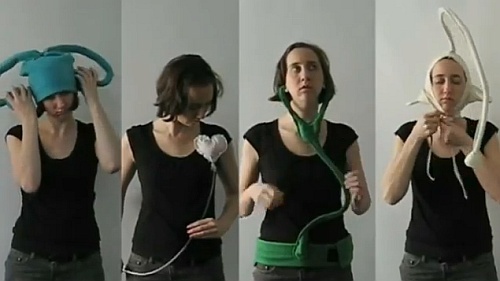 As the title implies, Kate Hartman goes one step further and designs wearable communication devices. I must admit I’m not sure I would want to wear the devices she designed. But I admire how simple these devices can be and yet some of them create an effective embryo of communication with others. Although some people think it’s a joke (see kalev’s comment on 2011-09-17 19:13:44 in the bugfix report), I won’t install this update; I agree it’s funny but refusing to install it at least gives me the feeling I have still something to say on my system (that’s also what free software are for, isn’t it?). Updated qlogic 2400 and 2500 firmware to 5.03.13. What does 5.03.13 do? No one knows, except for QLogic, and they’re not telling. I asked, and they told me that information was only available under NDA. So, I encourage you to imagine what this firmware does, and the bugs it fixes. 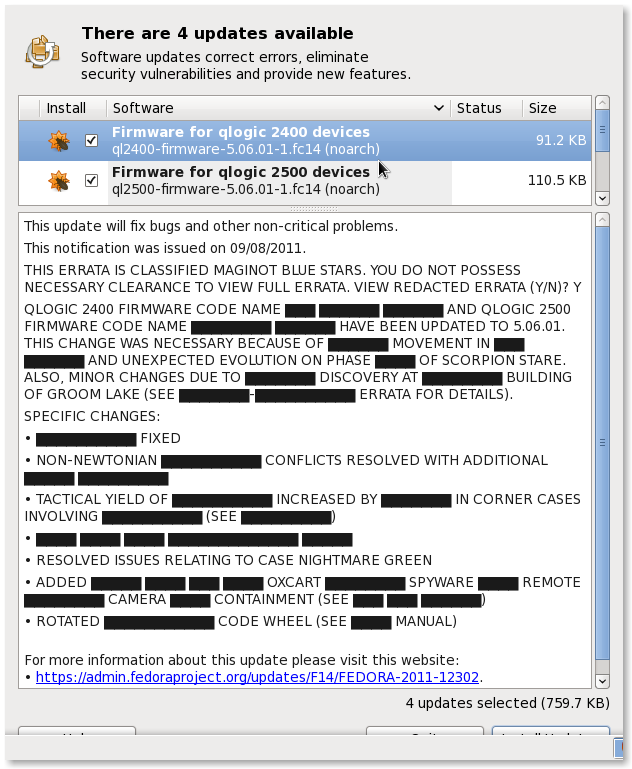 While you’re at it, imagine a world where vendors release source code for their firmware. Google+ (G+) is a social networking and identity service operated by Google. It started a few months ago like a closed service from where you can’t get out any data and where the only possible interaction (read/write/play) is only possible via the official interfaces (i.e. the web and android clients). Google promised to release a public API and it partly did so tonight, here. As they stated, “this initial API release is focused on public data only — it lets you read information that people have shared publicly on Google+” (emphasis is mine). So you can already take most of your data out of G+ (note that it was already possible to download your G+ stream with Takeout from the Google Data Liberation Front). As usual, it’s a RESTful API with OAuth authorization. It comes with its own rules and terms (it could be interesting to add to GooDiff). The next step would be to be able to directly write something on Google+. Reference Manager is a commercial reference management software package. It is extensively used in biomedical research, along with Endnote (sold by the same company), mainly because the main OS in these labs is Windows from Microsoft. I used it at the university and still have some reference databases in its format (with file extension .rmd). This evening, I had to go back into one of those proprietary, closed databases I still had (most of my references were later re-entered in a BibTeX file). I could have borrowed my wife’s computer running Windows or tried some Open Source software that can open .rmd files. But it would have been too easy. So I tried it with Wine, a program that allows Microsoft Windows applications to run under Linux. In Wine AppDB, it is written people had tried version 9 and 11. In the old time, I bought a student license for version 10. I’m running Fedora 14 and Wine 1.3.24. The installation didn’t cause any problem. Launching the application neither. 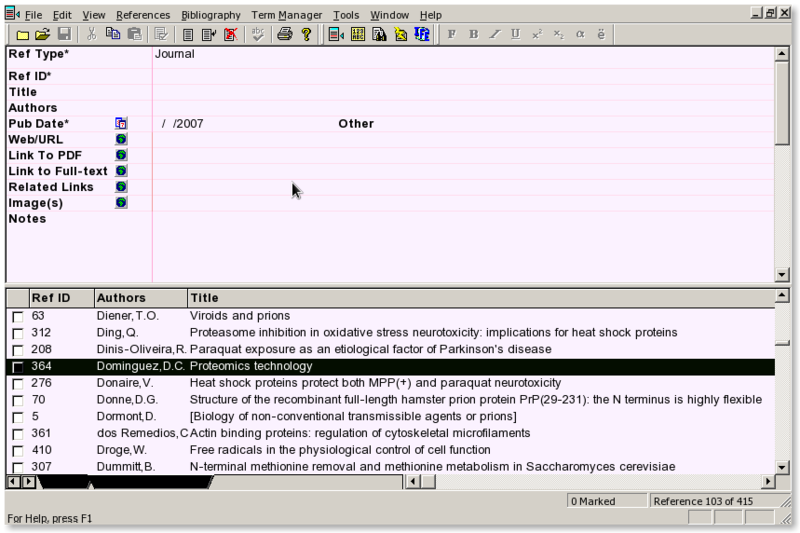 I can easily open existing database and see the reference summary (bottom part of the screen, see screenshot below). But I can’t properly see the reference details (upper part of the screen). In fact, all the details are there but they are not properly rendered. If you click in one of these fields, you’ll see the text from these fields. But once you’ll click elsewhere, the previously clicked field will disappear. The search function in the database is working. The export of a bibliography list from a selection of references in the application works. I was not able to test the integration with MS-Word. Note that it cannot search in PubMed (but it’s probably due to the fact the update for PubMed was not installed). I also submitted an entry in the Wine AppDB ; it is currently reviewed. This well-known French proverb is similar to: “pride comes before a fall”. This evening I was told by the newly installed version of Firefox that my Flash player was outdated. Firefox provides a simple link to download that Flash Player. I save the installer (install_flashplayer10_mssd_aih.exe) in a directory where I save all my downloads before sorting them. 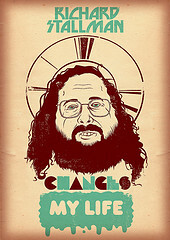 I launch the installer. It moves itself to my system temporary directory and launches itself again. First I find it very rude from the installer to move itself anywhere on my disk. Then now, since 15 minutes it’s stuck at the step where it tries “retrieving install”. Adobe Flash, if you want to play tricks, do it cleverly! Now your installation is stuck and cannot download the remaining part of the installer because it should use a proxy. 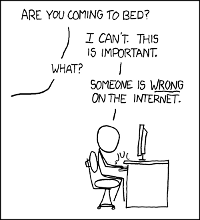 This is a known issue, of course. And the simple and most obvious solution is that you can download the true, full Flash player installer here. Why not provide this link immediately?